There’s a lot of talk in the trade press about the analytical divide—the gap in capabilities of businesses that use analytics versus those who still rely on management reporting. Much of this discussion involves the applications that can close the divide by adding analytics capabilities to traditional reporting functions. Four types of applications show up in these discussions: data discovery, real-time streaming event data, Big Data and visual analytics solutions. (We’ll review the first three now and VA next time in Part 2.) Application developers have market-ready products in each of these areas. We’ll take a look at the capabilities that potential IT buyers are looking for. A Gartner report predicts that a majority of BI vendors will make data discovery their prime platform offering. This reflects a move from rules-heavy, centralized BI platforms that push reports to users to ad hoc querying and other analytic tools. These tools have generated interest for some time, but they were seen as too difficult to use. More recently, vendors who jumped the ease-of-use barrier have been rewarded with industry praise and hefty sales. TIBCO Spotfire data discovery software has pioneered in this area with a powerful but easy-to-use platform. 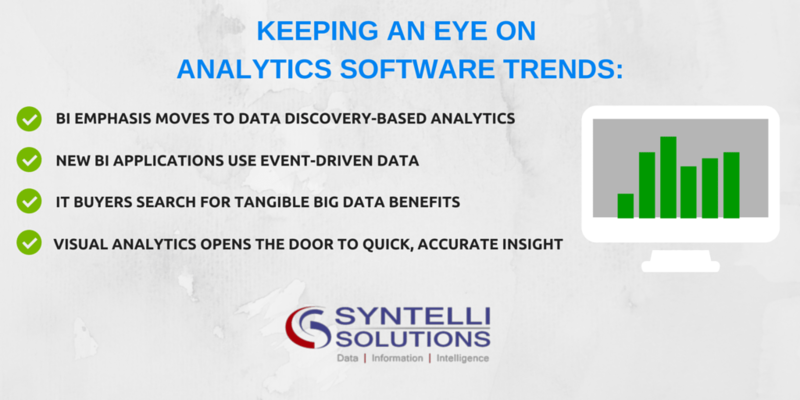 The Spotfire approach to data analytics enables business users to find their own answers to business questions. That’s one reason why Spotfire has kept its years-long position in the Leaders part of the Gartner BI Magic Quadrant for Business Intelligence and Analytics Platforms for 2014. Vendors are developing analytics solutions that combine event data streams generated by operational technology assets (instrumented machines and devices) with event data from applications or individuals. In these applications, data collected from OT and IT systems will be rated for its probable future business relevance. When this happens, enterprise business leaders will expect access to easy-to-use analytics technologies that make sense of this data. High on their priorities list: the ability to quickly produce autonomous insights and inferences. The search for tangible benefits is keeping many enterprises stuck in the strategy and planning stage of Big Data adoption. IT buyers and stakeholders are looking for solutions that can make a convincing business case for solving their specific problems. Vendors have responded by developing application that enhance the customer experience, improve process efficiency and using Big Data to monetize stored information. Capabilities that address data volume, variety and processing speed are getting the most attention. Volume issues are the easiest to understand and deal with. Maximizing the value of unstructured and semi-structured information is much more difficult. In this case, monetization requires more storage space, new tools and the experience and skills to use them. Next Time: In Part 2, we review visual analytics tools.